Bossa Studios has been known to make some pretty whacky games in the past. With titles like “I Am Bread” under their belt, you have to imagine what Surgeon Simulator is like. The standard versions of the game quickly showed players that the title was tongue-in-cheek to say the least. Your, uh, “surgeries” typically involved removing all of the patient’s organs so you can give them a transplant. It’s ridiculous, and fiendishly difficult on the PC, but how does it translate to PlayStation VR? Does this procedure go off without a hitch, or is this patient DOA? Now that I’ve earned my Bossa-approved medical license, I’m prepared to give you the answer. Normally I would talk about story here, but Surgeon Simulator just gets you straight into the action. Much as I would like to make up something about how you’re actually in some sort of punishment dimension and your recurring patient is a modern day prometheus being punished by the crow again and again (which would be a metaphor for you as the doctor), it’s not that complicated. 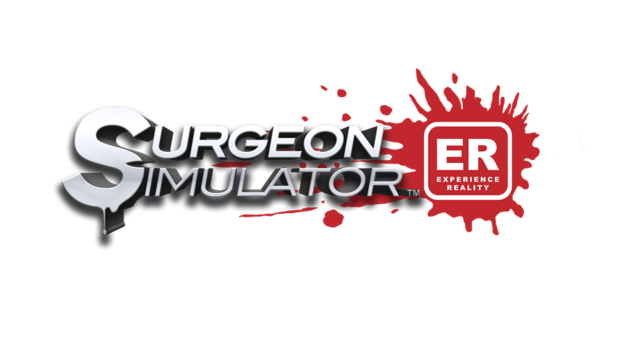 Instead, you start Surgeon Simulator: ER (which stands for “Experience Reality”) in front of a desk, with a clipboard used to select the various locations and surgeries. There are three locations and five surgeries to experience in the game, along with a secret one that I won’t spoil. Each surgery can take a few minutes, or a lot longer depending on your circumstances. A ranking system gives you the opportunity to try and maximize your score, while a variety of tools, both medical and deadly) give you some variety with how you tackle each surgery. Now, it’s worth stating that Surgeon Simulator is supposed to be a complicated mess. That’s kind of its schtick. On the PC, you literally had a button for each of your fingers, I’m not kidding. Thankfully, the Move enabled VR version just has a couple buttons to control your floating hands. The difficulty here comes from factors that are both intended, and in other cases, not. For starters, the game’s latest version, which is what I played, can be very finicky if you don’t get your setup exactly right. From what I understand, the latest patch has significantly improved tracking, but you still need a lot of space and a good height on your camera if you want to have a relatively smooth experience. After numerous bouts of testing, I found that I needed the light on above me, about five feet of space between the camera and I, and the camera needed to be on top of the television (which is 60” in screen size). This combination of factors resulted in a largely flawless tracking experience. The alternative, of course, was that my hands would constantly lose tracking when I went to reach for tools. Once I had the setup correct, the experience was infinitely better. This was odd for me, because it was the first game where I had to go to such great lengths to make it work properly. Other titles worked with the camera on the bottom of the TV just fine, sitting or standing. I will say that Job Simulator required me to modify the setup, but Surgeon Simulator was the first time since I bought PlayStation VR that I had to modify my entire setup for playable results. That being said, when it was working, I was having a blast. You’ll still get some whacky physics, and in some cases I dropped my organ transplants on the floor. In this scenario, there’s not enough tracking for me to reach down and pick it up, so I had to reset the level. Furthermore, your hands will freeze when you’re about to collide with something. Instead of ghosting through solid objects, a skeleton hand appears until you remedy the situation. It’s not ideal, but it works for letting me know that I’m out of bounds so to speak. If there are any future patches that continue to enhance the tracking, they would be welcome. It's worth noting that the game's developers quickly took to social media and Reddit when the game released and promised to improve the tracking. With the latest patch installed, it absolutely works if you get the setup right. In an industry where most studios would move on, that kind of dedication is worth mentioning. As it stands, the game is very fun when you get everything setup correctly. There’s something so delightful about pounding a rib cage with a hammer until it’s shattered and then proceeding to pull out intestines and throw them out like yesterday’s garbage. I know I sound like a maniac right now, but the game’s light-hearted style and graphics makes it less of a gore fest and more wholesome body humor. The surgeries are nice as varied as well, offering several unique options. More would be welcome, but what’s here has a lot of replay value and combinations of procedures and locales. So really, what it comes down to is the picky nature of the game’s motion tracking. It needs to be just right for a high-quality experience. Otherwise, easily frustrated gamers will quickly find themselves in need of a controller transplant. See what I did there? Okay, moving on. The graphics in Surgeon Simulator: ER are excellent by PSVR standards. The game’s simple, but effective style results in crisp textures and great depth on PS4 Pro. It’s silly enough that you won’t get nauseous has your disemboweling your patient, but it’s also complex enough that you know what you’re doing. Whether you’re whacking away at his ribcage with a hammer, or plucking his eyeballs out with a plastic spoon, Surgeon Simulator is very fun when it’s working properly. The VR edition brings the humor to life in a way that VR only can. My only caveat, and it’s a big one, is that the tracking requires you to mimic your subject in the game, in the sense that you have to be patient (sorry, I had to). If you can get the setup in a good spot, you’ll find a lot of fun here for your $20. Only start this surgery if you’re willing to do a little trial-and-error with your calibrating. If you can handle that, then I’d say give this one a try. Just, don’t expect to be a full-fledged doctor when you’re finished.